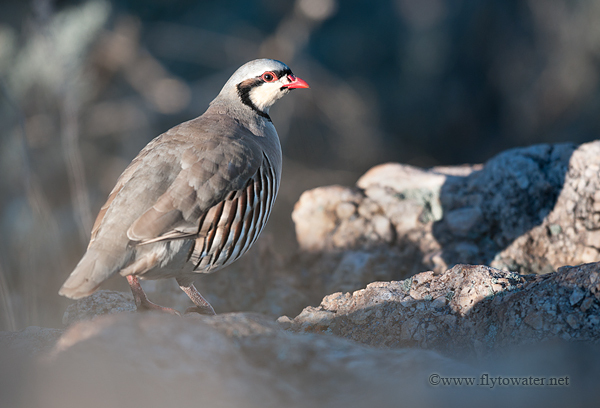 Shooting through foliage is usually not ideal, but chukar partridge are fiendish birds with a natural inclination toward sneakiness. It is not uncommon for a photographer to make loud, rattling sounds with the throat that carry at least as far as alpine yodels after being very close to a large covey and getting no shots whatsoever. The unpredictability of wild subjects will at times preclude the ability to move and recompose. In these cases, foreground foliage can be used as an element to draw the viewer to an area of crisp focus. When using this technique, it's critical to achieve a high amount of detail in the area of interest. Catch light in the eye and sharpness throughout the bird's mask and head grab attention, while also leaving something to the imagination. Despite spending the morning in the general proximity of around 40 birds, this was the only opportunity that panned out. I'll be chasing them again.